Gujarati Kitchen is a book written by Bhanu Hajratwala, a cook par excellence and fondly called as 'Martha Stewart' of Indian cooking by her family and friends. In spite of being born and brought up in the Fiji Islands and having spent her life so far in different countries around the world, she and her family have kept the flavour of traditional Gujarati food intact. In this book she gives a brief introduction about her journey with food and devotes several pages to basic pantry, utensils necessary for cooking, conversion charts and general tips in addition to an enormous collection of traditional Gujarati recipes. The cover page of the book is simple and elegant and is perfectly synonymous to the traditional recipes inside. The recipes are clear and easy to follow along with notes, tips and hand illustrations which will surely appeal to beginners and professionals alike. And the beautiful colour photographs of several dishes are so tempting that you will be forced to try them soon. The recipe section of the book is divided into 11 parts: starters, main dishes, breads, rice, accompaniments with rice, sweets, chutneys and relishes, Pickles, Favourite tea time snacks, Drinks and mouth fresheners. Paturi, Ondhiyu, Thepla, Dhokla and Khichadi are some of the most popular dishes presented here. Apart from the vegetarian dishes, this book also features non vegetarian fare like Kheema Fataka, Masala Rajji, Tarela Jingla, Kheemo and Marghanu Shaak. Every recipe in the book is explained in great detail with a brief summary about it, the occasion when it is cooked, possible accompaniments, tips, serving suggestions, and freezing ideas. Various ingredients used in cooking are explained in the basic pantry section and recipes of various spice blends like chai masala and fresh masala which are indispensable in Gujarati cooking are also explained in detail. The author has also given two sample menus to help readers with meal planning. 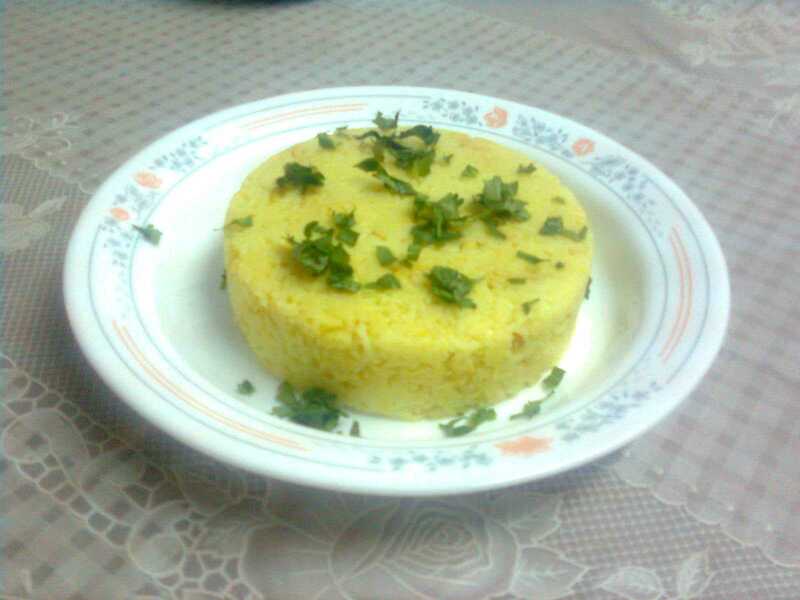 Of the several delicious looking dishes, I zeroed in on two recipes from the book, Khichadi and Marghanu shaak, a type of Chicken curry and decided to try them. 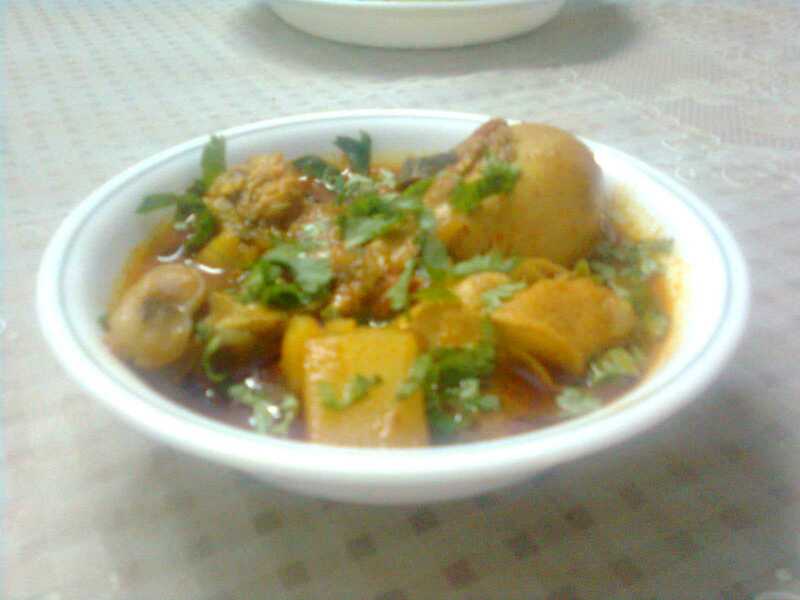 Both recipes were easy to prepare and the final outcome was mouth watering. Her step by step instructions were easy to follow and the time taken to complete the cooking was also perfect. Both these recipes have now found a place in my recipe diary and I am planning to try other recipes soon. Gujarati Kitchen opens the door for anyone trying to learn Gujarati cooking. It is a beginner’s delight and features several time tested recipes. The instructions are easy to follow and the author has given notes and tips for better understanding. The colour photographs of the various dishes gives a brief idea as to how the final outcome should look like. The book is priced at Rs. 395 which is quite reasonable compared to the huge collection of recipes inside. 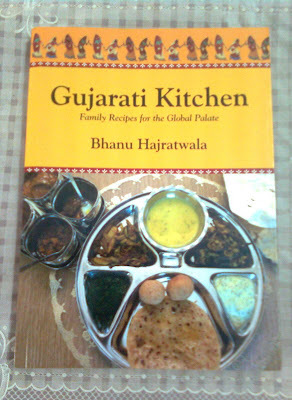 I would recommend this book to anyone who wishes to cook authentic Gujarati food. True to its name it is indeed a perfect guide to family recipes for the global palate. Very nice review...That is indeed a good book to have on hand..
yes the review is great. Must have book it is. Having just spent a week in Gujarat area, can't say I am a huge fan of the food, but I guess different part of the state make different kinds of foods - Nice review Amina :) Thanks for sharing dear!